A wide range of learning modalities include online instruction, project-based learning, group projects, and individual tutoring. The Flex Academy Virtual goal is for each Flex Student to graduate high school on time, with a postsecondary plan in place. The Flex Academy Virtual courses have a fully endorsed English, Social Studies, Math, and Science teacher who provides content expertise and online support. Flex Virtual Students can schedule time to come into the Flex Studio to meet with teachers for extra help and to take tests, as well as communicate via phone, email, and Skype. 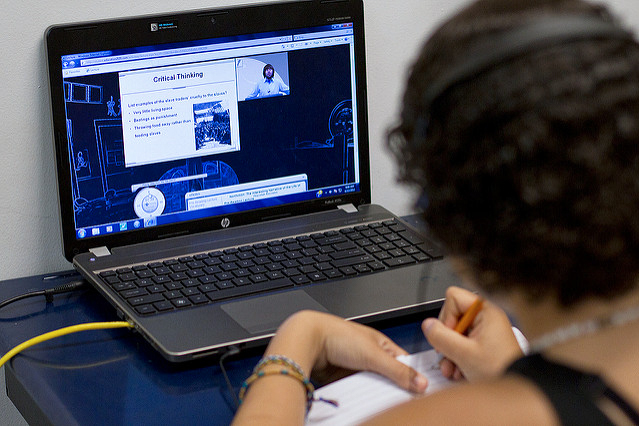 Students are supported to discover academics through an online program. Learning topics range from global, national, and local perspectives, and are designed to relate the curriculum to real world experience. Students are expected schedule time with their content teachers to take all district assessments in the Flex Studio. Students are assessed using the standards-referenced approach, which is instruction aligned to content-focused learning standards. Through the online program, Flex teachers guide the students through knowledge they are expected to learn, provide continual feedback for improvement, provide re-teaching opportunities when necessary, and allow numerous opportunities for practice. The results yield self-direction while preparing students for postsecondary goals. The Flex Academy Virtual program is designed to accommodate students who are in need of additional support as identified by the school’s student support staff. Priority for enrollment is given to re-engaged students and under credited seniors. If you are a student who believes you might be missing credit, or likes to work at your own pace and is interested in an innovative learning environment, please contact your Flex School Administrator to see if you quality.